The text below is a summary, for the complete text click here. In 2012 we were able to renovate large areas of the home which included the kindergarten playground and the new entrance. ln addition to renovating the school building in terms of painting, it also meant new boards and installations. Working with children with learning difficulties has been accomplished. 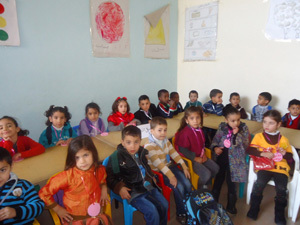 Diagnostic tests were made for fifty students and further steps were taken to work with these children on improving their academic abilities. Training was also organized on how to use the smart-interactive board which will also help children with learning difficulties. 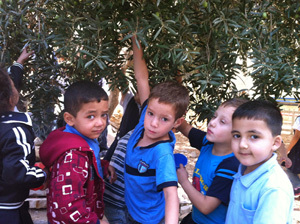 Moreover, Jeel al Amal participated in the project of comprehensive development for kindergarten schools in Jerusalem. Teachers participated in various courses such as the mental condition of the expert, drama in education, story structure (telling and reading), multimedia, art and nature and last but not least autism. Children celebrated ‘World Health Day’ in a joint breakfast with visiting doctors. The children were medically checked up by the physicians. And the event was concluded by a lecture on healthy eating, and hygiene. 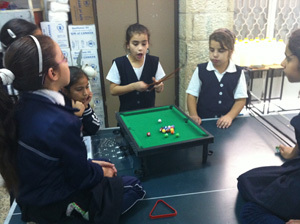 Our children won the championship in Table Tennis, competing with schools in Jerusalem Governerates. Jeel al Amal’s Sports Supervisor has had training in Birzeit continuing Education in Sports Management in cooperation with the FIFA. The boys participated in the Art Exhibition, which is held on a yearly basis in Jerusalem. Furthermore, an artist will be coming on a weekly basis to Jeel al Amal for an art workshop with the children. This will also include wood carving and puppet making. Believing in music and noticing its positive impact on our children, a professional music teacher has been appointed to train the school choir and give the children music lessons on various instruments. 2012 has been a good year. lt is our aim to create a safe and homely atmosphere for our children and to provide opportunities for growth and development. Keeping the hope alive has always been the motto of Jeel al Amal. Amidst all that is happening on the political scene and defying financial difficulties, a ray of hope always shines through and brings a brighter day for the children as well as opportunies for growth and development at Jeel al Amal. So, looking back at the year 2012, we feel it has been a good year at Jeel al Amal. We are blessed with friends visiting the home and seeing the children in action and others wanting to support us any way they can. The children love meeting new friends who make them feel thought of and loved. We thank all our dedicated friends for their continued support and friendship. Their financial as well as their moral support is greatly appreciated and give us the strength to continue our humanitarian work, knowing that we are not alone. May the new year bring with it bundles of joyous moments to you and your families. And may it bring peace, justice and well being worldwide.